This beautiful carpet has been handcrafted by our master artisans in 100% New Zealand wool. The warp in cotton and weft in pure wool. 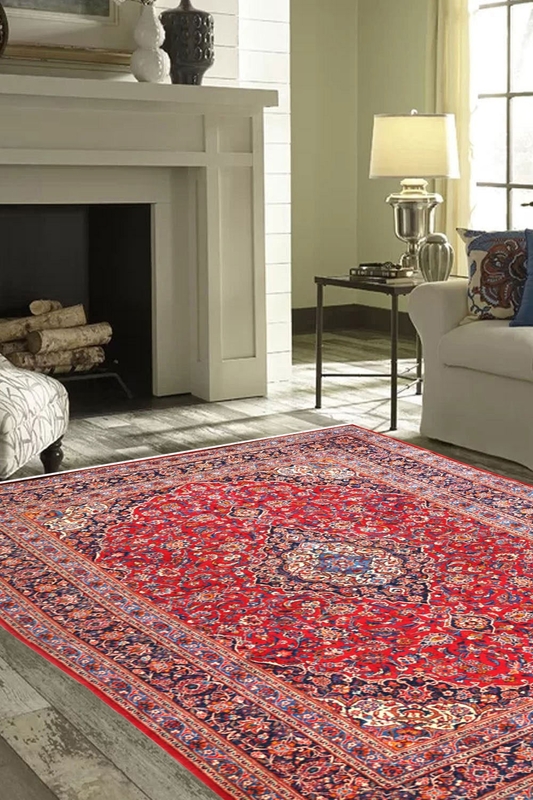 This is 100% hand-knotted rug and ideal for a bedroom as well as for a living room. Intricately woven with such perfection, This has a beautiful color collaboration in the pure floral pattern. The floral pattern is most of the famous pattern for the carpets. When you place it in your bedroom, you will feel like you laying in a flower garden. It has taken about 8-9 months to weave. This is a large area rug which is really good for any place. The primary colors are red with a shade of ivory and blue. The center with flower design increase the beauty and make different from other carpets. The design of this carpet is called medallion Kashan which has been originated from Persia in 17th century.